Introduction: In this article i have explained how to upload the image through file upload control and save in binary form in Sql server database and then read/retrieve the data along with image and show in GridView data control in asp.net using both C# and VB languages. Description: Basically you will learn the following through this article. How to upload image in website folder through file upload? How to save uploaded image in Sql server database in binary format ? How to read/retrieve the image stored in binary format from the sql server database and bind and display in GridView data control? 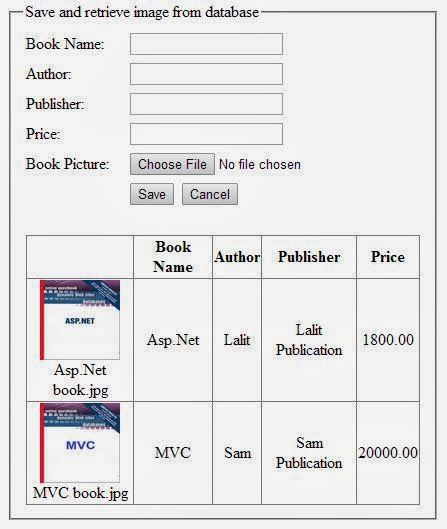 I have created a sample web page from where i will insert book record like Book name, its author, publisher, price and Book picture. As soon as a new record will be inserted it will get binded to the GridView control as show in the sample image shown above. Implementation: Let's create a demo website page to insert data including image in database and retrieve that data and fill in Grid View data controls. Create a folder in the root directory of the project and name it "BookPictures". Uploaded Book images will be stored in this folder and the path will be saved into the database so that we can track the image from the folder if required and this image will be converted to binary format and stored in database. Design the page as described in C# section above. lblStatus.Text = "Book Record saved successfully"
lblStatus.Text = "Book Record could not be saved"
lblStatus.Text = "Book record could not be retrieved"
" I hope you have got the code trick to upload image in website root folder and store image path in database and then retrieve the image path from sql server database and Bind and display in GridView using asp.net and If you like my work; you can appreciate by leaving your comments, hitting Facebook like button, following on Google+, Twitter, Linked in and Pinterest, stumbling my posts on stumble upon and subscribing for receiving free updates directly to your inbox . Stay tuned and stay connected for more technical updates." If you have any question about any post, Feel free to ask.You can simply drop a comment below post or contact via Contact Us form. Your feedback and suggestions will be highly appreciated. Also try to leave comments from your account not from the anonymous account so that i can respond to you easily.. Create registration form and send confirmation email to new registered users in asp.net | Activate or approve user account by activation link in email address.